Picked some for my windowsill. What are they called though? My mother calls her plants like that “money plants” – because they look like coins, I guess. Yes I’ll go with honesty and I used to take ours apart when I was young too. Ours used to grow with those orange lanterny thing and teasles. Very 70s flower arranging. I just found your blog through a blog list on Tongue In Cheek and had to pop over for a visit! The minute I saw your photo, “A money plant!” popped into my head. I grew up in Massachusetts and we had money plants growing behind our hen house, along with burrs and a creeping rose vine that were both vicious in their own right. When we dared venture into that spot we would gather all the “money” we could so we could play Store. Ah, childhood. I’m off to see what else you have to offer on your sweet blog. Silver Pennies. 🙂 I think the names are regional in origin, but I do have to wonder if Silver Pennies in particular came from some part of the UK, wherever our ancestors came from. Also saw it called Lunaria annua. Probably depends on where it grows as to whether it self-seeds or has to be planted every year. Around here it self-seeds, but will gradually die out. I checked with my mum to make sure (she’s 83 and forgets nothing… really, nothing! ) and we used to call it Honesty too. We also used to visit friends when we where wee whose folks had a Hotel at Loch Earn, and they used to call it Honesty too. I still find it hard not to be jealous of that fabulous light you have in your neck of the woods, I have the same conversations about it with Ilva over at Lucullian Delights, as she has the same. ;o) Still, I suppose I should just get my backside up North more often and then I’ll be fine! In South Wales we called it Honesty too. My friend’s Mum had it in her garden and I loved to try and see through the flowers when it was sunny. We had it growing in our garden in Tasmania when i was a child. My mother called it honesty – I alwasy thought of it as a money plant. 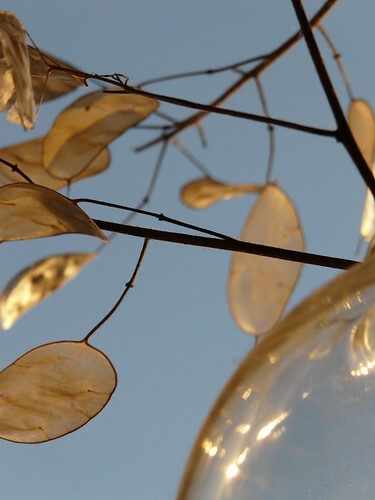 I love the biological name ‘Lunaria’ with its reference to the moon.